The three common formats are 8mm, 16mm & Super 8. There are two transfer options such as the raw footage onto a hard drive option (.avi transfer) that can allow customers to edit the video at their leisure or the transfer and encode option where the video is transferred onto DVD for viewing on DVD player/drive. Some videos can even be uploaded to a social network (for an additional charge) depending on size. The rendered production is then placed within the encoding program and output into a single file. Once encoded the file is imported to the DVD authoring program chapter markers are created as well as a menu is added. An image file is created and this file can is transferred onto an Archival DVD. 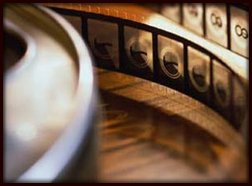 8mm/16mm – Raw Transfer Per Ft.
8mm/16mm – Transfer & Encode Per Ft.